Moorman's in Hardin County Kentucky about 1800. This was probably around Big Spring and Bewleyville area. From an old newspaper clipping about 1960? Probably the Quincy, Illinois daily, the Herald-Whig? Visitors to the annual open house of the Historical Society of Quincy and Adams County Sunday will have the opportunity to see one of its latest acquisitions, a blanket spun and woven by Mrs. Lucy Robinson from wool raised on her plantation in Hardin County, Ky., around 1800. 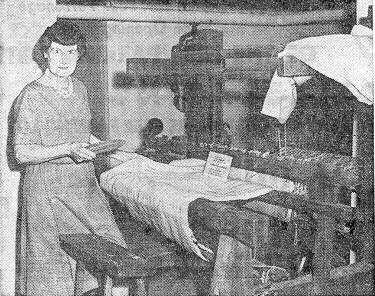 The blanket has been given to the society by Mrs. C. A. Moorman, shown pictured with it. Mrs. Robinson was the great-grandmother of Miss Virginia Moorman and the late C. A. Moorman, the late E. V. Moorman and the late Miss Vennie Moorman. Arrangements for the annual open house of the Historical Society of Quincy and Adams County Sunday from 2 to - 5 at the Historical building, 425 South Twelfth, have been made by Mrs. Louise Weems Abbot president of the society's Women's association board. Guides from 2 to 3 will he Mrs. James N. Keefe and Mrs. Everett Windsor on the first floor, Mrs. William J. Dieterich and Mrs. William S. Black on the second floor, and Mrs. Roxanna Peine and Mrs. Matt J. Peterson in the lower level exhibit room. From 3 to 4 Miss Mary Louise Kidney and Miss Ruth Bywater will be in charge of the first floor and Mrs. Robert L. Wilson and Mrs. Howard Mosher of the second floor. Mrs. John Maxwell and Mrs. Charles A. Heidbreder will be in the downstairs exhibit. room. Mrs. James P. Nielson and Mrs. Wal1ace P. Elmslie will be on the first floor from 4 to 5 and John R. Fick will he the guide on the second floor. Mr. and Mrs. Russell F. Lahl will be in the lower-level room. Mrs. Bryson M. Blackburn will serve refreshments from 2 to 3. Mrs. James R. Reed from 3 to 4 and Mrs. W. C. Swallow from 4 to 5. Mrs. Abbot, Mrs. J. Emmett Wilson and Mrs. Jack E. Hafner comprise the refreshment committee. Three special exhibits have been set up in the lower - level display area. A blanket made by Mrs. Lucy Robinson, great grandmother of Mrs. Virginia Moorman and the late C. A. Moorman, the late E. V. Moorman and the late Miss Vennie Moorman, is one of the society's latest acquisitions, given by Mrs. C. A. Moorman. An exhibit of Mettlach porcelain from the collection of Russell F. Lahl will be of great interest. The pieces were manufactured by Villeroy. and Boch in their Mettlach factory in Germany, established in 1841. Another feature of the lower level exhibits will be an early Edison phonograph, in working condition, loaned by John Maxwell for the open house. Visitors will also see two cast iron miniature cannon, childhood toys of the late Lawrence E. Emmons, Sr. These are on loan from Mrs. Lawrence E. Emmons, Jr. A collection of books and periodicals read by Quincyans in the 19th century has been assembled by Miss Ruth C. Holum, librarian of the society, for display in the Memoriam room on the first floor. The public is invited. 1. Moormans were in Breckinridge County (formed from Hardin County in 1799) by 1809, when James Venable Moorman (1777 Louisa Co. VA-1867 Breckinridge Co. KY) and wife Catherine Katy White Moorman (d. 1821) settled there. James Venable Moormans uncle and aunt, Jesse Adams Moorman (1762 Bedford Co. VA-1843 Brandenburg KY) and Elizabeth Buckner Stith Moorman (1762 Campbell Co. VA-1823 Brandenburg KY) moved to Hardin County sometime between 1803-12, as ascertained from the scanty information I have about the birthplaces of their children. James Venable Moorman and Catherine Moormans son, Pendleton Chapman Moorman (1799 Campbell Co. VA - 1892 Big Spring, Breckinridge Co. KY) married Susan G. Robinson (1816 Breckinridge Co. KY - 1891 Big Spring, Breckinridge Co. KY), Jesse Adams Moorman and Elizabeth Buckner Stith Moormans granddaughter. Pendleton Moorman and Susan Moormans son Thomas Robinson Moorman (1849 Big Spring, Breckinridge Co. KY - 1928 Quincy, Adams Co. IL) married Lucy Moreman McKay (1852 Big Spring, Hardin Co. KY -1917 Quincy IL), who was Susan G. Robinson Moormans niece. Charles Aaron Moorman (1887 Big Spring - 1948 Quincy IL). some time in the 1930s until his death in 1948. The company ceased to exist in 1998, when it was sold to Archer Daniels Midland. 4. There are several connections to Stiths in these lines; for the purposes of the newspaper article, the rug-maker, Lucy McKay Moorman is the great x3 granddaughter of Richard Stith, Sr.
6. Credit goes to Judy Canant who provided me with key data to help me figure out the complexity.